Freshman Jabari Parker (1) was one of four Duke players (Rodney Hood, Amile Jefferson, Quinn Cook) to score in double figures against UCLA. NEW YORK — It was an average performance from Jabari Parker, and it drew praise worthy of another stellar effort by the Duke freshman. "He’s a natural," Blue Devils coach Mike Krzyzewski said after Parker had 23 points and 10 rebounds in an 80-63 victory over UCLA on Thursday night at Madison Square Garden. "In different sports there are people who are naturals. Jabari is a natural. He can become even better. He embraces the moment." Bruins coach Steve Alford was impressed with the 6-foot-8 Chicago native. "He’s gifted. He’s got a lot of smoothness to him. He can be a big guard or post you," the first-year UCLA coach said. "You don’t see a lot who are this polished 10, 11 games into the year." UCLA sophomore guard Kyle Anderson jumped in on the praise. "It’s tough to say who is the best player on the floor, especially with that team and our group of guys, but he played really well," said Anderson, who had another all-around game for the Bruins. "We wanted to shut him down but he’s tough." Parker was 7 of 13 from the field, including a 4-for-8 performance from 3-point range. He also was 5 of 5 at the free throw line and had five assists while scoring at least 20 points for the ninth time in his 11 college games. He hit a big 3 and had an impressive dunk during Duke’s 16-4 run that broke open a tie game in the second half. "I’m just going to do whatever it takes to win," Parker said. "I don’t have to take 20 shots for us to win, I can as long as they’re good shots. I’m just learning to play the proper role right now." The Blue Devils (9-2) poked and prodded UCLA’s 2-3 zone from the perimeter, making 11 3-pointers in a season-high 32 attempts from beyond the arc. 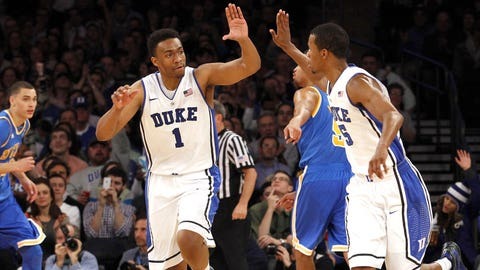 Rodney Hood and Quinn Cook both had 14 points for the Blue Devils. Cook had five assists and all eight of Duke’s steals. "We did a good job hitting Amile (Jefferson) in the middle of the zone and he became the toss-back guy," Krzyzewski said. "He got the ball right back to guys and they got rhythm shots." David Wear led the Bruins (9-2) with 16 points and Anderson, who has taken over at point guard, had 15 points, 10 rebounds and seven assists. He entered the game averaging 13.8 points, 8.7 rebounds and 6.7 assists. "Quinn Cook did a good job of pressuring the ball. That 94 feet of pressure is tough," said Anderson, who had six turnovers. "They didn’t let us execute our offense. Duke’s signature is the pressure defense, That’s what they want to do and we fell into it." UCLA’s zone kept the Bruins in the game. Wear, who went 4 for 4 from beyond the arc, made a 3 to tie it at 43 with 17:58 to play. Duke suddenly began to connect from outside with consistency and Hood hit two 3s and Parker added another in a 16-4 run that put the Blue Devils up 61-49 with 11:33 to go. The Bruins twice got within eight points, but they got no closer in front of the crowd of 15,410. UCLA, which entered the game averaging 85.1 points, was 8 of 22 from 3-point range. Justin Adams, the Bruins’ leading scorer coming in with a 21.2 average, was held to 10 points on 4-of-10 shooting. "I thought they did a really good job on him," Alford said. "This was the first time this season he’s been held like that, containing him and keeping him off the free throw line." The win was Duke’s 23rd straight in the month of December and lifted Krzyzewski to an 8-1 record against UCLA. The Blue Devils are 2-1 at Madison Square Garden this season having beaten Alabama and lost to Arizona in the NIT Season Tip-Off in November. Duke’s other loss this season was to Kansas. UCLA’s other loss was at Missouri.